I got home kind of late last night from MLA08 in Chicago. It was really a great meeting. The best thing about meetings to me is always the networking, and this one was extra-special. I got to see a lot of my friends from San Antonio -- both the ones who are still there and the quite-a-few of us who have left in the last couple years. One of the highlights for me of the actual program was futurist Andrew Zolli. Usually, I dislike futurists -- they always seem to think they're better/smarter than the rest of us, and they never understand what librarians do. Zolli was totally different. First of all, he was funny! He had also done his homework and he knew about medical librarians and even MLA's projects, like Librarians without Borders. And, best of all, he freely admitted that futurists are usually wrong! During the meeting, I saw several other knitters (and compared socks with one), a couple crocheters, and a woman who was doing Tunisian Crochet. I wish I had gotten up the nerve to ask her about it, but I guess I found that giant hook intimidating! 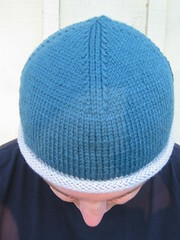 The second Baby Cable Rib Sock was just a few rows of ribbing when I got there, and look at it now! I discovered that I could put my little notebook and my pen on my knee, and knit above them. Then, if I was inspired to scribble a note, I was ready. This is a great pattern for me -- enough "pattern" to keep me inspired, but rote enough that I didn't need to think too hard about it. 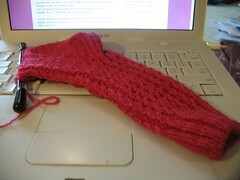 I even turned the heel while listening to a panel talk about web (2.o?) applications in libraries! Oh -- and the group that was moving into the Hyatt as we all moved out on Wednesday? They were a little different from us -- and I can't stop wondering if there were any knitters among them! Your conference does sound interesting! 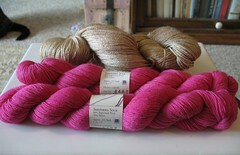 Hee hee - you're as bad with the pink sock yarn as I am with the black'n'purple. you were that close and I didn't KNOW?? Hee hee-that tops the Harley convention that was in the Sheraton Birmingham during the AL Library Association conference-a bit less leather, I think. Hah! International Mr. Leather! Too bad I decided that I'd make next year my first MLA meeting! What a hoot. I wonder which group tips better?